Optimization: Journal of Research in Management (ISSN 0974-0988) is a bi-annual peer reviewed journal that has been started under the initiative of GL. 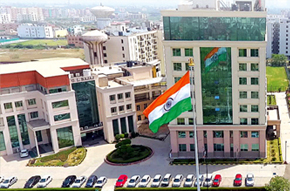 Bajaj Institute of Management and Research, Greater Noida. GL. Bajaj Institute of Management and Research is committed towards providing quality education with a flexible learning approach. ‘Optimization Journal of Research and Management’ is another milestone in the pedestal of GLBIMR’s achievements. Its focus is to achieve unparalleled excellence that will bring development to the society and mankind by optimizing their potential. The aim of this journal is to bridge the gap between the known and the unknown, between theory and practice and also between perspectives of academics and those of the corporate world. It consists of multi-disciplinary, interdisciplinary empirical and conceptual research work dedicated towards advances in contemporary and futuristic research in the area of management. It endows readers with sound knowledge base, collaborative analysis and ability to appreciate varied views of a vibrant peer group. The attempt is to enable researchers understand the complexities of contemporary management challenges. The Journal focuses on empirical and applied research that is relevant to practicing managers and meets the standards of academic rigor and contains research papers, articles, case studies and book reviews related to all disciplines of management.The online access of the Journal is also available at http://publishingindia.com/.